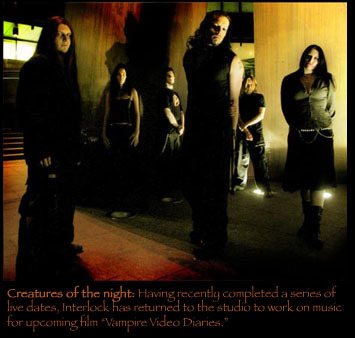 For an electronically tinged metal band that is signed to an independent label and only released their first full-length last year, Interlock sure has a way of winning the popularity contests. Rock Star Journalism: In what ways do you think Interlock has changed since you began in 1997? Hal: Our hair is longer, that's for sure. I think that was inevitable. There have been some musical changes in some ways, which I think has been down to personnel. 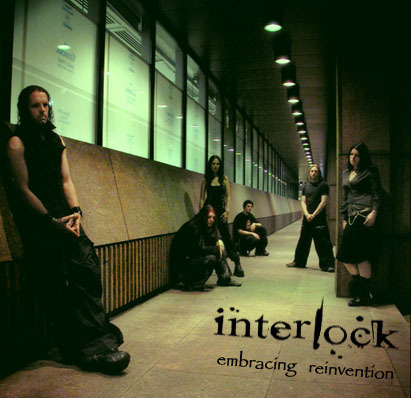 Those who may be familiar with some older material of ours might have heard a hardening of sound lately, but Interlock did start off being pretty heavy in the first place; I sometimes regard what's happened in the last three years as a return to form in some ways. John: I'd personally put it mainly down to my development as a producer, having better -- or at least more -- equipment and the abilities of those in the band growing. Obviously, our influences have grown even more, because we've simply heard more. RSJ: There are clearly a variety of musical interests within the band. How does the collaborative process work? Hal: Recently, a majority of the melting pot of influences has come about through discussion on the tour bus. I use the term "discussion" openly of course. John: Normally, we blindfold [drummer] Matt, give him a pin and "John Noaks' big book of musical genres" and let the magic happen. Hal: I'd say the biggest key to how it all comes together is a successful degree of communication between all of us. We do tend to trade songs and recommendations, and it's not like all the ideas have to come from someone recording a riff or lyric. RSJ: You've had numerous line-up changes -- do you feel that the line-up you have now is fairly set? John: I hope it is. I really get on with everyone in the band, and as long as everyone enjoys what they're doing it should continue to grow and develop into something even better than it currently is. Hal: It's likely that every band will insist at any point that their lineup is the strongest it's ever been, but in truth, the six of us have reached a very equal level of technical strength now. We're all aware of trying to reach our full potential with our given instruments, so it's fair to say we're all running at the same pace now. RSJ: You found a new female vocalist this year with Christina Gajny. Have you had to make any adjustments to the songs to accommodate a new person singing them? Hal: If anything, Christina has improved the songs rather than enforced any allowances or negative changes. Her range is phenomenal, and her work in the studio in recording the tracks for the "Skinless" EP has just been so professional. Not only that, but the last number of months that have passed since she's been co-fronting the band has seen us change our live approach and demeanor in a way that has made things so much more enjoyable. The next album we release is going to raise some eyebrows in the way of expectations in female metal vocals. RSJ: You released "crisis//reinvention" just last year. Why the wait in putting out your first full-length album? Hal: I think we're okay to admit that we have a pretty stringent system of quality control as a band. The album was self-produced, so it allowed us to make finer changes when we felt they were necessary. We didn't want to rush things for what was to be our commercial debut. 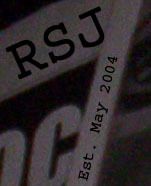 RSJ: You also released the "Skinless" EP, which contains a variety of remixes. What stood out to you about the tracks that you chose to include? John: The majority of the remixes are from bands or artists that we approached. We were aiming for a vast palette of bands and genres to give "Skinless" a going over, as it were. We knew that certain bands would do something "trippy" or have drum and bass, and that's what we wanted. We're fans of a lot of styles, and we kind of wanted that to be put across in a very blatant way. I think all the remixes come out sounding very different from each other and the original, which can only be a good thing. RSJ: Do you have a favorite of the remixes? Hal: Sadly, my favourite wasn't featured on the final cut. I felt that Will Young's acapella remix really opened up a new angle on the song, but unfortunately not everyone saw eye to eye on it. RSJ: You received acclaim for the "Death By Design" split with Needleye. Are there any other bands you would want to do something like that with? Hal: There are a lot of bands who are currently forging ahead with new sounds. Alongside Needleye you've also got people like Concept, Ikon, Shellshock, Dexycorps, Deadpad, Elsid and loads of others. It would be difficult to single out any one act to work with again in the same way, but that's not to say that we won't ever do it. Certainly, it would be great to work on another split release, but for now I think it's more important to get another album of original material out there. That is, unless Fear Factory leave an answerphone message; we've been screening our calls lately and Burton does tend to be shy. RSJ: Much like Needleye, your music tends to straddle the line between metal and industrial. Having played shows for both types of crowds, which scene do you believe to be a better fit for Interlock? Hal: There's really no definite scene that we apply to, other than that which we've seen develop around us and other associated bands playing cyber metal, which is fast becoming its own moniker. More and more metal audiences are becoming comfortable with hearing electronic elements in the music they're moshing to, so it's not like we're only attracting a specific type. John: It's been really interesting watching this scene grow up around us. The band came into being, conceptually at least, just before Fear Factory released "Demanufacture," which influenced me greatly. Since then we've tried to tread our own path introducing varied elements into the mix. It just so happens that industrial started to do this a lot as well. All of this is of course great because that's what we've been striving towards for ages. I truly feel that the mainstream is only now starting to catch up with us. RSJ: If there was one thing you could change about the UK music scene, what would it be? Hal: Chairs. I'm harboring a personal vendetta on any venue which has a seating option, and I'm considering applying for an endorsement with Homebase for sledgehammers. Unless you're wanting your audiences to use them as weapons, best throw 'em out. John: I think the respect that sometimes is lacking towards smaller touring acts needs to make an appearance. I'm only really talking about soundmen and some promoters of course -- we've never seen or experienced fans getting weird with bands, unless maybe they ask for it (laughs). It would also be nice for the UK not to be so swayed by American music all the time. There are some excellent bands that don't hail from the States around at the moment; it would be a shame if they had to stop because of lack of interest. RSJ: What has been your favorite touring experience overall? Hal: There have been plenty of notable experiences, like AA recovery engineers forgetting that they'd severed a petrol feed pipe in our van and turning the engine on, or seeing the promoter of a night take a whole table down, covered in half full pint glasses -- must have looked at him in the wrong way, you know how these tables can be. In a positive way, any gig that we perform where the crowd sings the songs back at us, which is happening now with an alarming regularity. RSJ: You've played both festivals and club shows; which do you think lends itself more to Interlock's live show? Hal: We're not really the sort of band to give preference. They're different formats of what we do, but no matter what happens, a gig is a gig and we'll always give it the full treatment. John: I love having room to move, as I can feel so stifled in two square feet of stage. I think the same goes for the whole band; we thrive on space, to the point we will invariably end up on the other end of the room standing on tables, if it's at all possible. RSJ: What was the most difficult live show you've played? Hal: As odd as it may sound, any gig that doesn't provide a large enough performance space poses serious issues for us. Rather than it being a brown M&Ms moment, it's actually down to the fact that we've got a drummer with a pretty large kit and five other members out front who never stop slinging themselves around and at each other. Without the adequate room to move it means that we're not able to put across the full show that we're capable of, and we're a band who hate to pull punches. RSJ: You shot your first video last year for "Skinless." I read that you changed directors midway through. What led to this? John: We commissioned a guy called Christian to do the video pretty quickly, as we were running out of options and time and his show reel looked great. We filmed in a huge abandoned print factory in south London for an entire day, which was complete hell because we were doing what we do on stage for about 45 minutes in actual fact for eight hours. We all came away bruised and bleeding. There were some fun moments with randomly destroying the building though. When we came to the editing process we discovered we really weren't on the same page as Christian. Luckily we discovered that Lasse [Hoile] was available for a couple of weeks. RSJ: How did you get involved with Lasse? John: Lasse was known to us for some time from his work with Porcupine Tree and Illdisposed. Matt had some connections via Porcupine Tree's label and the fact he'd played keyboards with the band for 10 minutes -- I think literally -- so we got in contact. He's a great guy and is pretty funny; I think we're going to work with him again if possible. RSJ: Have you been happy with the amount of exposure you've received with Anticulture Records? 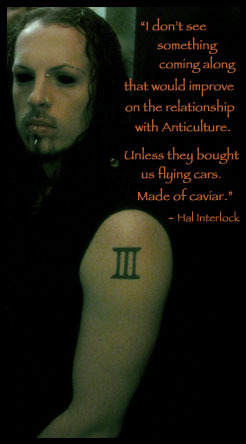 Hal: We're very happy where we stand with Anticulture. We found that quite early on we were on the same level as them with regards to what they want to do with the UK metal scene. The care and attention to detail that we receive from them is nowhere near what we'd get from being just another number on the roster of a major metal label. RSJ: Do you think you would you want to make a switch to a major label if that was offered? Hal: Funnily enough, without naming names, quite a number of people we know who are signed to the "larger" labels have had almost only bad things to say about their situations and representation, which is such a pity, but at the same time something which makes us all the more glad for signing to a company which has our best interests at heart. Obviously, you have to take business angles into account, and should something be offered that would mean things were giving blatant avenues to success then I think all parties, label included, would shake hands where necessary. That said, I don't see something coming along that would improve on the relationship we have with Anticulture. Unless they bought us all cars that fly. Made from caviar. RSJ: Awhile back, I read a mention of a possible US release this year. Is this still in the works? John: It certainly looks that way; our distribution is getting better by the day, and we have the US penciled in for the latter half of the year. This may or may not go according to plan of course, but we certainly believe there's a strong fanbase out there for us, given the excellent response via things like MySpace. RSJ: Are there any plans to tour in the States? Hal: We'd love to, and there have been some requests from fans. I think it's down to whether we can get our hands on the right artillery. RSJ: Have you begun work on the next album yet? John: Yes, there are a few tracks that have been written in their raw forms. We all realize this next record is going to be really something very special though, so we want to make sure we're really doing everything in our power to make it that way. I think we're all looking forwards to it. RSJ: What's the most important goal for Interlock at present? John: In real terms, making sure that we get out there and play live to people, wherever they may be. Hal: Diversity. And making sure that we continue to push boundaries, that includes our own. Aside from that, there's getting our album played on one of the moons of Saturn, we may consider buying a small country, or even getting a family of Bengal tigers named after us. It depends on whether we're concentrating too hard on growing our hair longer or not. Got something to say abut this feature? E-mail us.